Note: Rebecca Michaels Haugh's entertaining and informative Love That Voice Over podcast is a Virtual Partner of Voice Over Virtual, the giant 3-day totally online voice over conference, Sept. 18-20, 2013, produced by VoiceOverXtra. My Love That Voice Over podcast series of in-depth interviews unveiling personalities and projects behind the microphone recently caught up with Juan Carlos Bagnell, aka "Some Audio Guy " - a fascinating freelance voice over director living in Los Angeles, who has been recording, producing and directing voice overs - plus handling sound production - for over a decade. 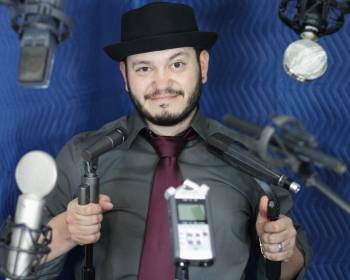 After building a solid reputation at Abrams Artists Talent Agency as a Booth Director and Assistant, Juan moved over to casting, working with the longest running VO casting company on the West Coast, The Voicecaster. In Part 1 of the interview, artist and engineer Juan flies us through his Air Force brat childhood - seeing alien aircraft Hangar 18 - and his move to LA. Ironically, a crappy cell phone doesn’t interfere with landing his first job at the Abrams Artists Talent Agency. Hi, I'm Rebecca and I am here with the fantastic Juan Carlos Bagnell. Tell us where we left off (from Part 1). You just end up with so many stories about the people that you meet at a talent agency. You're just sort of inundated and especially at a place like Abrams, which for voice over is a premier talent agency. I still consider them to be one of the tops. And like ... I spent a half hour on a commercial audition with Zooey Deschanel. Especially an Indy sweetheart, that to have her crossover with this commercial success is fantastic. So, she was in for a Coca-Cola VO audition and I think we spent 15 minutes talking about how cool it would be to own pet robots. (Rebecca laughs) She is so genuine. She is so sweet and so much fun to work with. And then to the same token at the other end, you're constantly encountering all of these incredible commercial and animation actors, and I was really spoiled. I got to work with a tier of talent far above what most people encounter when they begin their craft as a director. Well, let's hang on to that. Can you define that tier, what aspects of it that you saw that you were able to recognize? Immediately, it's the confidence. I mean, when you're working with people that are booking on a regular basis that already have established careers, that have established reputations - that, I think, is the most striking because I wasn't prepared for the beginners of our craft who don't have that confidence. And so there was a frustrating transition when I left Abrams, in trying to sort of hold people's hands for a while. I wasn't used to that. No, you didn't have to do it before. You hadn't had to do it. Can you describe the confidence a little bit more? Can you give some examples, like what is that like with Zooey Deschanel or Richard Dreyfuss? Is it the joy? Is it the spirit they come in with? What else can you do to describe the confidence? The biggies know what they do. I think in our eagerness to please, we have created a class of voice actors who are so eager to please that they think they can do anything. You've just got to tell them what you want. What do you want? What do you want? What do you want? And I'll do it. And that ends up actually working against a lot of actors. Meaning they think they can play anything, but they really can't because a Zooey Deschanel is going to be different than a Richard Dreyfuss. Not only in a male/female but in terms of that personality, they could both be male or both be female, is that what you mean? To boil it down, yes and no. You look at someone like Zooey Deschanel and, I mean, this in the best possible way, but Zooey Deschanel was never trained to be a voice actress. So she doesn't know how to be a voice actress. She knows how to be Zooey Deschanel and so she walks in and she delivers a performance that she has thought about, that she has considered from the material, and there is no questioning what she is there to do. And so, that's what I mean. It's like she doesn't know that she shouldn't be confident in this regard because she is an established performer. You start losing with voice actors who've been trained to be voice actors and don't know anything else but voice acting. They start doing this, "I can do anything." And I really do feel that there's a place for every voice. 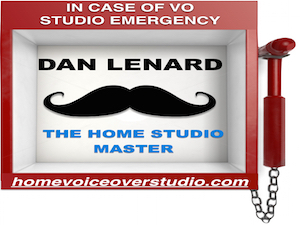 I've worked with some really interesting people and some really interesting voices, but I think we trained voice actors to lose a sense of who they are or a sense of self in this mad rush to fulfill all roles. I don't believe there is a magic read. I don't believe that. You know, if you could just say the words on this piece of copy in just the right way, that's what's gonna guarantee you the booking. I think it's more about attitude and personality, and if you have the attitude and the personality for the job, then that's why you booked that job. That's why we're seeing so many celebrities in voice over now because it's much easier to walk into a room and say, "Robert Downey, Jr.," than it is to walk into a room and say, "Well, we're looking for sort of a snarky attitude who is very forward thinking and modern and progressive and someone who is going to appeal to a certain demographic where we're looking at high technology and cars and they're sort of irreverent." I could walk into a room full of suits and say all that, or I could walk into a room and say, "Robert Downey, Jr."
But it's much easier to feel like your advertising messages are being taking care of when you've got someone like a Robert Downey, Jr. walking in. He is a clear personality. You get to sort of piggyback on his reputation, on his cred. And you're confident that he's going to go in there with his vibe. You don't have to worry about creating that part. You can focus on the rest of the commercial. What's the status of the industry today in terms of commercial and advertising commercials with voice over? You know, it's a really interesting sort of multifaceted to answer. (There was the) SAG strike and well, it became easier for people to go non-union and this is true to a point. You know, it's the danger of a lot of the pay-to-play sites that I see as people are building their careers. They're ending up signing contracts that I don't think they fully understand the ramifications of, from a long-term perspective. Like it's cool if you want to make a little cash on the side, but that's not really the basis of a career in my opinion - if you want to drop everything and do nothing but voice over, you really want to be careful. And about how your voice is used. Especially like usage. Usage is something that I really, really wish we could teach more actors about because you start seeing - well, yeah, it's a $500 job but it's a buyout in perpetuity. It means that they own that audio on you forever, and forever is a really long time. So the 2000 strike happens and what we see today is a constant pressure on the workaday voice actors who aren't celebrities. We're seeing consistent pressure on the low end from the non-union side - or maybe not even the non-union, just what used to be sort of the, "We'll throw you on the booth for 15 minutes" stuff that actors used to make their living off of. That's kind of gone now. And a lot of the campaign voices at the high end are going with celebrities because they can get them. So that leads to a narrower and narrower middle gap of opportunity. Kind of like - oh my God, kind of like the middle class is getting squeezed. Absolutely. That is the perfect way to sum up what's happening in VO right now. That being said, I still think it's in that middle area where you see some of the most exciting growth. Because of things like the web exploding, we're seeing a tremendous number of opportunities that just don't happen to pay as well as commercials used to. So with advertising going online, you're seeing some really interesting campaign-style work with websites, approaching audiences in new ways. So from your perspective, let me jump in and ask a real quick question about advertising agencies. Are you seeing that advertising agencies are embracing the new technology and maybe at this point have learned how to embrace it in a fuller way, but being cognizant of their clients' budgets and this vast landscape where they could spend money? Well, a lot of companies are throwing a lot of money into this social or viral - or whatever we want to call it - landscape and not seeing a huge return on their money. But at least we're seeing them approach it. You know, embracing might even be a too strong of a word. Fantastic. That's a great view of what's happening today. Thank you so much! Rebecca Michaels hails from California but lives some of the time in Italy, currently voicing a variety of English-speaking projects with folks from the U.S. as well as Australia, India, Germany and the Netherlands. 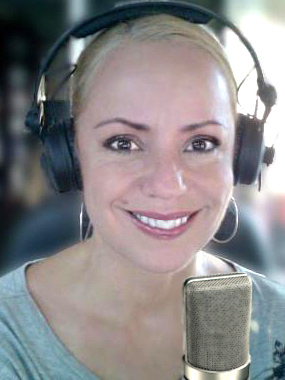 She interviews voice over pros in her Love The Voice Over podcast series (see link below), and keeps in touch with friends and fans via Twitter, Facebook and LinkedIn.